High-ranking South African football and government officials stand accused of offering a $10 million bribe to secure the 2010 Soccer World Cup. According to a US Justice Department indictment, this would have been the second bribe paid by South African officials, after a first attempt to secure the 2006 Soccer World Cup failed. The sordid details of South African alleged involvement in the global FIFA corruption scandal have been revealed, albeit scantly, in the US Justice Department indictment of some of the organisation’s biggest players. In the indictment, two high-ranking South African bid committee officials mysteriously dubbed Co-conspirator #15 and #16, are accused of twice bribing controversial Jack Warner, who was then FIFA vice-president. The identities of the co-conspirators have not been revealed as no arrests have been made. The first trove of cash, a bribe for the failed bid to host the 2006 Soccer World Cup, was delivered in “$10 000 stacks” to a relative of Warner in a hotel room in Paris. “Previously, the defendant Jack Warner and his family had cultivated ties with South African soccer officials in connection with and subsequent to a failed bid by South Africa to host the 2006 World Cup. “In the early 2000s, Co-Conspirator #14, a member of Warner's family, had used Warner's contacts in South Africa to organise friendly matches for Concacaf teams to play in South Africa. At one point, Warner also directed Co-Conspirator #14 to fly to Paris, France and accept a briefcase containing bundles of US currency in $10 000 stacks in a hotel room from Co-Conspirator #15, a high-ranking South African bid committee official,” the indictment reads. The document revealed that the South African government had paid the sum of $10 million to secure the votes of three FIFA officials to secure the 2010 Soccer World Cup. “In or about 2004, the FIFA executive committee considered bids from Morocco, South Africa and Egypt, as well as other nations that withdrew before the vote, to host the 2010 World Cup,” the indictment continued. “In the months before the selection of the host nation for the 2010 World Cup, which was scheduled to take place in May 2004, the defendant Jack Warner and Co-Conspirator #1 travelled to Morocco as they had done in 1992, in advance of the voting for the 1998 World Cup host. While in Morocco during the 2004 trip, a representative of the Moroccan bid committee offered to pay $1 million to Warner in exchange for his agreement to cast his secret ballot on the FIFA executive committee for Morocco to host the 2010 World Cup. “Subsequently, Co-Conspirator #1 learned from the defendant Jack Warner that high-ranking officials of FIFA, the South African government, and the South African bid committee, including Co-Conspirator #16, were prepared to arrange for the government of South Africa to pay $10 million to CFU to ‘support the African diaspora’. 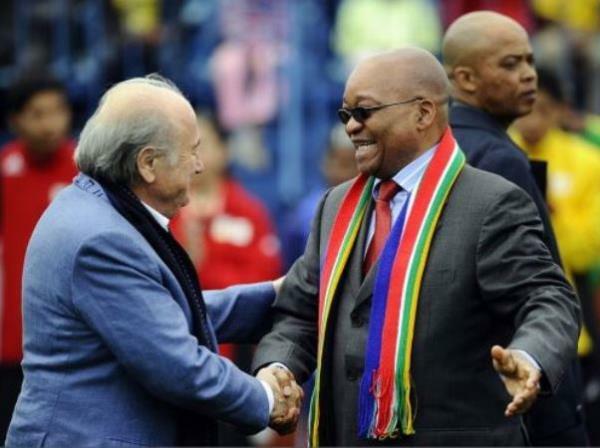 “Co-Conspirator #1 understood the offer to be in exchange for the agreement of Warner, Co-Conspirator #1, and Co-Conspirator #17 to all vote for South Africa, rather than Morocco, to host the 2010 World Cup. “At the time, Co-Conspirator #17, like Warner and Co-Conspirator #1, was a FIFA executive committee member. Warner indicated that he had accepted the offer and told Co-Conspirator #1 that he would give a $1 million portion of the $10m payment to Co-Conspirator #1. “In FIFA's executive committee vote held on May 15, 2004, South Africa was selected over Morocco and Egypt to host the 2010 World Cup. Warner, Co-Conspirator #1, and Co-Conspirator #17 indicated that they voted for South Africa. “At one point, Co-Conspirator #1 learned that the South Africans were unable to arrange for the payment to be made directly from government funds. Arrangements were thereafter made with FIFA officials to instead have the $10m sent from FIFA - using funds that would otherwise have gone from FIFA to South Africa to support the World Cup - to CFU.